Third time's the charm for O'Malley and me! I absolutely adored this book! Scott Pilgrim never really won me over and Lost at Sea is terrible, but Seconds is hands down brilliant. I guess I've always kept going back to O'Malley because I love his art; it has that manga look without really going all the way. As per usual Bryan brings to the reader a tale of magical realism this time with time/space shifting and house spirits. 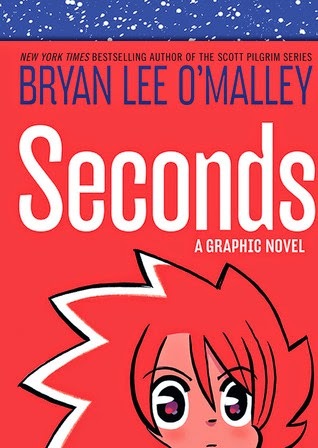 The title sounds mysterious and right away we find out that "Seconds" is the name of the main character's restaurant but as the story progresses there are a few other ways the title can be interpreted. All the characters are quirky and lovable in their own ways. I especially found myself drawn to Hazel, a tall, model-like beautiful 21yo who is painfully shy and nervous and hasn't dated as she's not sure if she's into boys yet. While the story is mostly humorous and bizarre, there are thought-provoking moments that made me pause. Altogether a brilliant mix of plot, characters and the odd make for one of my favourite graphic reads in a while. I must add though that I am a bit miffed that Bryan's author blurb on the jacket flap fails to mention his Canadian identity, especially when the copy I own says, "Random House Canada" right underneath!